Ok here's how its going to work out, for the month of December, I will do 2 posts per day: one (like this one) not related to the holidays, and one that will have Red/Green or nail art related to the holidays. Thank you to everyone who voted in the poll, these were the results. The true color was hard to capture. By the way, this was with me for over a year before I decided to try it, if you have it please take it out of the dark and into the light, it's so worth it. i'm loving it! Number 1 on my kleancolor to buy list!! This is one of my all time favorite polishes, and it looks gorgeous on you! I am really a huge fan of Kleancolor, the metallics and the holos have really been wowing me, moreso even than recent collections that have been coming out lately. And you can't beat the price! 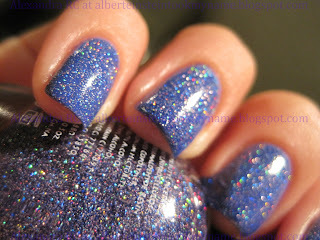 I love holos-this is so pretty! @ Nail Polish Anon: Don't forget to get Starry Purple if you like pink glitter, it was my first KC and what got me into the brand. @ Sirena Sparklestar: thank you! @ Jacqui: I regret not trying it earlier, it's really awesome, I know what you mean about the price, especially if you can find them in a store. I haven't tried the metallics yet, but I've heard good things about them. @ Fingers: yeah these holos are great, they're more like holographic glitter than scattered holographics, but still great. Gor-geous! I've never used Kleancolor polishes but they seem to be well received. I may have to go hunting for them. And I <3 holos. LOVE this! I have Pucci-licious and now I just need Holo Chrome to top it! :D I really need to get some Kleancolors. This one is at the top of my list! What a beauty!